A stunning 3 bed semi-detached period property in the popular village of Low Bentham, on the western tip of North Yorkshire. With access to the spectacular Yorkshire Dales National Park, Forest of Bowland, Lake District and Morecambe Bay, this well-appointed property is an ideal family or holiday home. Available with no chain, viewing is recommended in order to appreciate the charm and comfort provided. Situated in a quiet private road, the property has a pleasant garden and patio to the rear, with parking space and solid construction garage. On the ground floor the accommodation comprises, entrance porch, spacious and comfortable living room, modern sun room, dining room, kitchen and cloakroom. 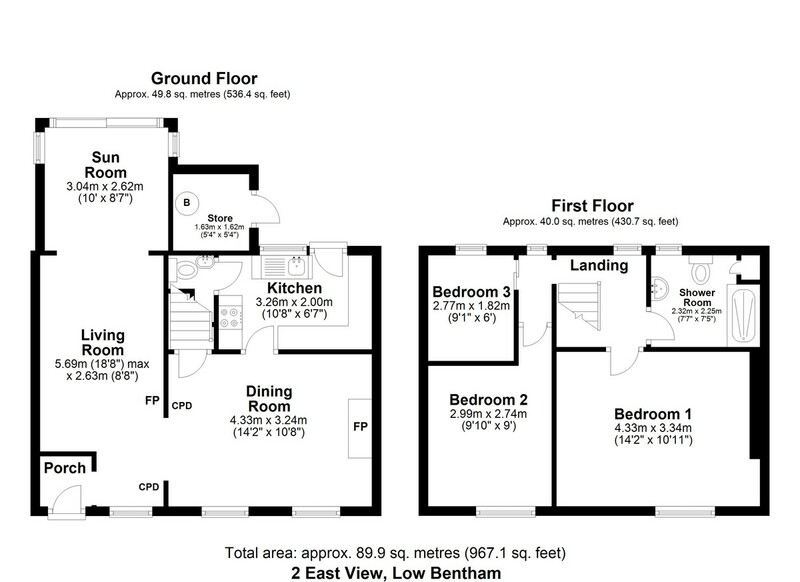 On the first floor there are two double bedrooms, a single and contemporary shower room. 2 East View was fully renovated to a high standard in the early 2000s and combines period cottage charm with modern living. Lancaster and the M6 are 25 minutes by car. The nearby A65 provides road access to Kendal and Skipton. On the edge of the Forest of Bowland, the stunning Yorkshire Dales National Park is close by and the Lake District can be reached in less than an hour. The coast at Morecambe Bay is half an hour by car. The property is on mains drainage, water, electricity and has gas central heating, with underfloor heating to the sun room. It is fully double glazed, with timber framed units to most windows and UPVC to the sun room. As the property is located on a private road, some contribution to upkeep may be required. PORCH Internal porch with front door to East View. Space for coats. Open doorway to living room. LIVING ROOM 18' 8" x 8' 7" (5.69m x 2.63m) Max. A comfortable, good-sized living room with window to the front aspect and opening to the sun room. Fireplace housing electric fire. Carpet. 2 Radiators. Opening to dining room with built-in cupboard. SUN ROOM 9' 11" x 8' 7" (3.04m x 2.62m) A charming and modern sun room with patio doors to the garden, windows to both side aspects and a feature roof light. Carpet. Underfloor heating. DINING ROOM 14' 2" x 8' 0" (4.33m x 2.44m) Another good-sized reception room with 2 windows to the front aspect. Fireplace housing electric fire with feature arched recesses to each side. Built-in cupboard. Carpet. Radiator. Door to stairs. Door to kitchen. KITCHEN 10' 8" x 6' 6" (3.26m x 2.00m) Modern fitted kitchen with back door and window to the rear aspect. Range of fitted wall and base mounted units. Sink with drainer. Integral appliances include, oven, hob with extractor, dishwasher and fridge freezer. Vinyl flooring. Radiator. Door to cloakroom. CLOAKROOM WC. Wash hand basin. Storage space with shelving. Vinyl flooring. Radiator. LANDING Landing with 2 windows to the rear aspect. Loft access. Carpet. Radiator. Access to bedroom 1 and shower room. Opening to corridor with window to rear aspect and doors to bedrooms 2 and 3. BEDROOM ONE 14' 2" x 10' 11" (4.33m x 3.34m) Good-sized double bedroom with window to the front aspect. Carpet. Radiator. BEDROOM TWO 9' 9" x 8' 11" (2.99m x 2.74m) Another double bedroom with window to the front aspect. Carpet. Radiator. SHOWER ROOM 7' 7" x 7' 4" (2.32m x 2.25m) Modern shower room with window to the rear aspect. Shower, WC and wash hand basin. Built-in cupboard. Extractor. Vinyl flooring. Heated towel rail. BEDROOM THREE 9' 1" x 5' 11" (2.77m x 1.82m) Single bedroom with window to the rear aspect. Carpet. Radiator.